-Available in TTD Original and OpenGFX sprites. Incorporated in one of Ben Kings' marvelous looking tunnels from his BK Enhanced Tunnel Set. I specially like how it makes adjacent tunnels look like just one huge tunnel with dividers. You can turn it off via parameters of course. Also, here's the full source files for anyone interested. I suggest looking into NML for coding though. I failed to run it on my PC years ago so I just used what I already have from previous newgrfs. Last edited by Froix on Wed Sep 28, 2016 3:16 pm, edited 2 times in total. Looking great! Really cool that you provided both the light and dark palettes, thank you for that. Unfortunately, it looks like this track is breaking compatibility with your Monkey Bar bridge, or at least that seems to be what's happening to me. 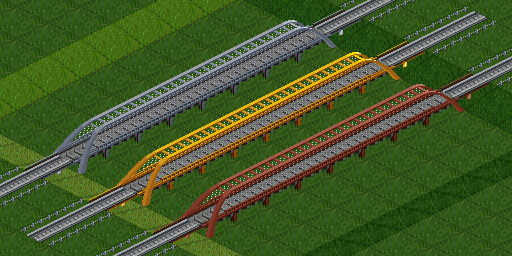 If I load your bridges after the tracks, I get the right bridge sprites, but the tracks on them revert to the installed baseset (minus the bridge-heads), and if I load it before, I get the right track sprites, but half the bridge reverts to the baseset chosen in your GRF's parameters, and the other half shows the Monkey Bar sprites (this is both with my usual NewGRF list and with just your two GRFs). I always get the same kind of glitches, albeit only with the two OTTD tubulars, when I use TBRS, too. Not sure if that's any good of a clue here. Great tracks, much more clear than the original maglev. Can I get the source somewhere? Aye, Either my bridge newgrf need update to support my maglev newgrf or the other way around. I updated my Monkey Bar Bridge bridge. Download update via content download to get the fix. Thanks! Full source now available from my original post. I updated my Monkey Bar Bridge bridge. Thank you so much for the fix, it's displaying nicely now! The auto-detect isn't detecting the light shade on my end, though, but manual works great. 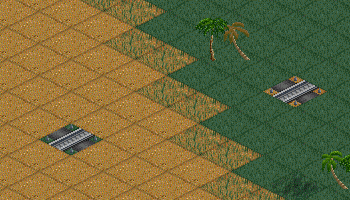 EDIT: Something else I've noticed - the level crossing sprites for Tropical desert and grass appear to be switched. Not urgent by any means, though. On Arctic they are displaying snow correctly. Aye, I can detect other newgrfs in the game but not the parameters set in them, at least I don't think I can. There is an NFO call for that, but no idea whether NML supports it too. I guess I never really looked into it. Fortunately, I can only do NFO and not NML. Another update up. It should be able to detect the maglev shade now. Also, here's the full source files for anyone interested. I suggest looking into NML for coding though. I had a look at the sprites, and wondered why you are replacing baseset sprites? Not to mention that you cannot publish original sprites under the GPL3 license, because they don't have a license that allows it, nor did you draw them. Ie if you build on work by others, you must make sure you have permission from them to use their sprites, either by agreement, or by license, where the latter is much preferred. Code is at the bottom, and that looks for a complete track type, though not sure how much you must specify. Using railtype is indeed much simpler, I've already used it once before. 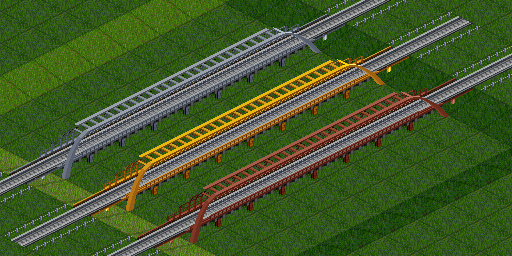 I initially intended to have it available for both OpenTTD and TTDPatch. In any case I've switched the newgrf to railtype. I'm not really familiar with GPL licenses and such. I was under the impression giving your work a GPL license allows anyone to build on it and publish it without need of permission so long as you provide the full source of your work and give proper credit. You also have to licence your derivative work under GPL. And thats pretty much it in general terms (IANAL). You do not have to ask special permissions from partial authors of the combined GPL licensed work. Also you can not combine GPL work with parts that are in violation of GPL (see also https://en.wikipedia.org/wiki/License_compatibility ) as release it as single new derivative work. Special point: there is GPLv2 and GPLv3, I do not know the exact differences. I was under the impression giving your work a GPL license allows anyone to build on it and publish it without need of permission so long as you provide the full source of your work and give proper credit. That holds only for your publication. The sources that you use have their own license, and you have to obey them too if you use them. Depending on what license they have, that means different things. It may mean there is no problem, or you are limited in your choice of license (ie any GPL licensed set demands you also use GPL for derived work). It may even happen that you find it's impossible to fulfill all requirements at the same time, in which case you can't actually publish your work. Eg if I would publish new track graphics based on your work, I would have to follow the license of your work. That license says I must use GPL license as well for my publication. If I don't want to use the GPL license for my publication, I can't use your work, and must make my own tracks from scratch instead. At that point I am the full author, and can use any license I like. I had impression that Froix was talking about extending an already existing GPL licensed work. Anyway, did there exists a problem to begin with and is solved now? I see that Froix has combined own work and work from BK Tunnels, that has been licensed under GPL, so should be ok? The tracks are a lot better than the usual maglev, where the directions with rail are hardly visible at junctions. I didn't know about BK tunnels, but yeah, other parts seem fine. Original sprites definitely do not have a GPL license. By this you mean the very original sprites and not the OpenGFX ones? Yes, "original sprites" refers to the graphics that are part of the Transport Tycoon Deluxe game. Can I have some information to solve a problem? I was trying to use FS-Maglev track along with a lot of other NewGRFs (JGR's Patchpack to increase limit) and my maglev and monorail have been combined, which is reasonable because I never use monorail anyway, but I'm getting the Maglev/Monorail graphics for your Shanghai Maglev Inspired trackset instead of FS-Maglev. Here's the weird part: I only started getting them when I tried to switch from dark track to light track. As you can see from the image below, I do not have SMITS active. Trying to shift back to dark track has not removed them. Removing FS-Maglev from my NewGRF list and starting a new game has not removed them. I've tried removing various other NewGRFs and I still end up with the SMITS track. So my question is, have you allowed any other NewGRF makers to include the SMITS rail graphics? Maybe I can use the process of elimination to determine which NewGRF is displaying the graphics? Cheers Froix, I'm glad you like them. Yeah, the single tunnel effect was part of why I wanted to create them (That and the enhanced tunnel effect, which I guess still isn't an OTTD feature). As for the GPL stuff, feel free to use them as you have, giving credit is fine. I made them for the community and hence they have the GPL licence.